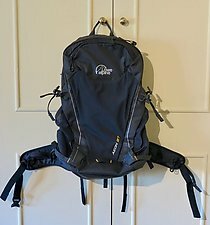 Lowe Alpine Aeon 27 rucksac. M–L Anthracite. Unwanted gift. £70 including postage. Very nice day-sack for sale. New and unused. Cotswold price £90. Call Alan on 07816 767651 or email alan@ledard.org.uk. Collect in Henley-on-Thames (near Reading) or I will mail on receipt of your cheque or bank transfer.